The Dual Suspension Terrain Bike for Men is another offering by Huffy. Featuring an aluminium suspension frame, this beast is ready to take on any kind of terrain. The bike comes with Kolo 5200 Series Suspension Fork that absorbs the unexpected hits and bumps off the road and offers a smooth and pleasant ride experience. SRAM Twist shifters have been used for gearing which offers 21-speeds and the riders of this bike have a wide range of gears to choose from. The shifting is extremely smooth and efficient. The bike comes with alloy linear pull brakes which provides some serious braking force and offers precision braking with superior control. The bike is equipped with a padded seat which is extremely comfortable. The seat also has quick release feature so that the height can quickly be adjusted according to your riding style. If you are looking for mountain bike which offers you speed, agility and comfort and comes with an affordable price tag, this one is your perfect choice. The bike comes with Dual Suspension Aluminium Frameset; Kolo 5200 Suspension Fork; Adjustable Handlebar; Alloy Rims; Padded Seat with Stitched Sides and Quick Release Feature; 21-Speed SRAM Shifters; Linear Pull Front and Rear Brakes; Steel Chain; Plastic Pedals; Knobby Tires (width 1.95 inches) ; Kraton Grips. Huffy’s Dual Suspension Bike for Men is a mountain bike which can also be used for commuting purposes. Equipped with an aluminium frame, the bike is quite light and nimble. The ride quality offered by this bike is quite smooth and enjoyable. 21-Speed SRAM shifters have been used for gearing and they function alright. The linear pull brakes function well and can bring the bike to a quick halt. Since the bike has a wide gear range, it can easily handle any kind of terrain that is thrown at it. The saddle of this bike comfortable and the riding the bike is immense fun. The bike does not ship fully assembled and assembling it might prove to quite a hassle if you have not done anything like this before. In case you face any difficulty, make sure you take it to your local bike shop. The gears and the brakes are not as well tuned as you would have liked them to be and you might have to get them tuned before you start riding it seriously. 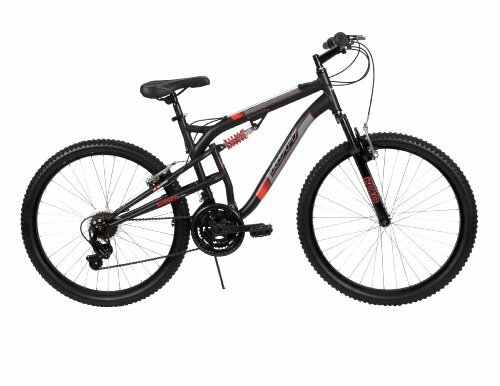 Overall, this bike delivers quite well on its promises as a mountain bike and offers a smooth and fun ride experience. It can also serve the purpose of a commuter. If you are a fan of off-road biking and looking for a mountain bike which comes with a reasonable price tag, you should definitely consider this as one of your options.